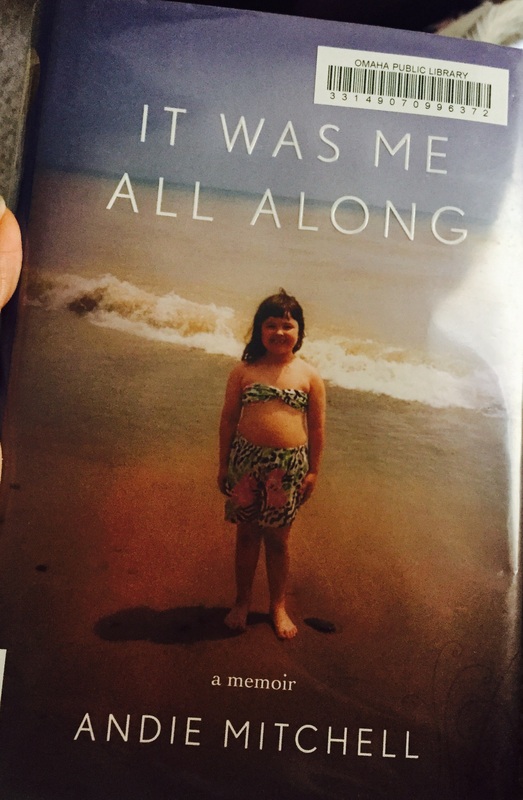 This month’s selection for Wendy’s Taking the Long Way Home Book Club isn’t really a running book at all, but is definitely something I was interested in: It was me all along: A memoir by Andie Mitchell. Thanks as always to Wendy for hosting! Be sure to check out her link up for more thoughts on the book from others. Andie Mitchell is a food blogger who wrote this memoir last year about her struggles with weight and with her body image even after her weight loss was “finished.” I will confess that this book was painful for me to read, both because she was clearly in a lot of pain during the times she describes and because I could identify so strongly with her descriptions of what it was like to be overweight, as they so strongly echoed my own experience. I will be honest, it was hard to relive those feelings, so be warned about that before going into this book. “I wished I could find some hideaway, somewhere I could be as reclusive as I pleased and just eat. And eat. And cry. And eat. And cry.” THIS. My life. Pretty much every day for years. She describes being in classes and being unable to “bring myself to raise my hand, fearing the attention it would draw,” which was very much my experience in college when I tipped the scale from chubby kid to obese young adult. I definitely had the same reaction to running late to class, in which ““…if I found myself running late to the lecture hall, even by just five minutes, I was compelled to skip the class altogether, knowing that few things were as anxiety inducing as trying to squeeze through tight rows of fellow students to find the lone open seat.” It seems unreal or an exaggeration, but I can promise you that those things were true for me as well. The temptation to resign yourself to being the fat girl is so real and so painful. Looking back, it seems like it was easier before I started caring about fixing this problem but I know logically it was a different kind of hard. Like me, Andie did find a way to handle the binge eating and lose weight, but she found herself swinging too far to the other side of the eating disorder spectrum in an effort to stay in control, after being out of control for so long. The swing to the other direction, of obsessive control and fear of food, is a very real possibility and something I’ve veered a bit into myself in the first year I was at my goal weight. I’m still trying to find that happy medium. It can be very easy to trade one eating disorder for another, as Andy did. The closing thoughts on the things she’ll miss were things I could have written, if I’m being honest. There are definitely still times I miss eating with abandon. I miss the days when my first response to a change in my food plan wasn’t fear, as it still can be (although that’s getting better). I miss that delicious, over the top food, even though I know it would cause me such a stomach ache I’d think I was dying now. I miss not having to think about all of this. I honestly don’t know if I’ll ever re-read this. I lived too much of it myself and reading it was hard. However, I’m glad stories like this are out there so that you can know you aren’t alone. There are people out there who get what you’re going through, as you move from overweight to weight loss to whatever this “after” period is supposed to look like. It’s always a good thing to have stories out there to show us we aren’t alone in the human experience. 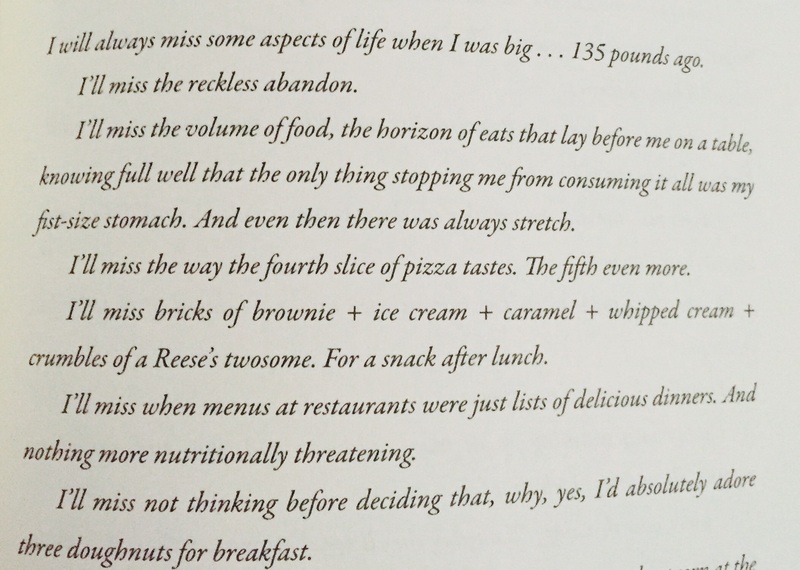 I hope that Andie has continued to find her way with a peaceful relationship with herself and with food. Do you find it hard to read stories that are too close to your own? I have it on my shelf to read right now! It’s definitely a good read! It’s hard to read something that hits so close to home. You should check out Andie’s blog–I have a link to it on my post, which will go up tomorrow morning. I’m so glad you read this and posted. 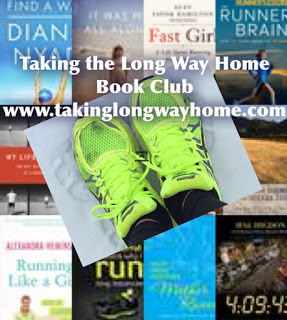 Thanks for sticking with the book club! Next month will be completely different! So many people think there is really an “after” where we’re done and that’s just not how this works for most of us.